So the big thing these days in beer seems to be the Northeast Style IPA. Make it so hoppy your head implodes, make it so hazy you couldn’t see through it with a klieg light, and make it so juicy you won’t have to eat citrus for a month. And the trend has hit Chicago area breweries since the summer. There are too many to name, and although I wish I could try all of them (and I have tried some), this entry will just focus on two I recently brought to a Thursday Night Beer Club. 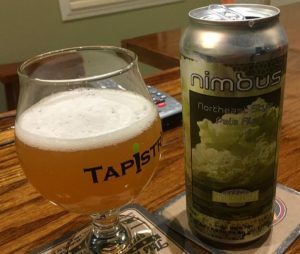 BEER ONE: NIMBUS by Hailstorm Brewing out of Tinley Park, canned 9/28/16. Color was a very cloudy dirty straw/gold. It reminded me of a glass of dark orange juice. The smell was mildly hoppy with slight floral notes. Taste was a slight tang of mildly bitter hops with a slight citrusy backing. Feel was dry, not a big mouth filling beer. NOTE ONE: I had this again on tap last week at Sovereign in downtown Plainfield, and I wouldn’t change any of the above notes or ratings. NOTE TWO: Hailstorm did three of these New England styles (last I checked). I don’t think I have had STRATUS, but I have had CUMULUS and I would highly recommend that one more than Nimbus. 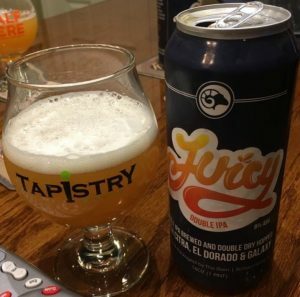 BEER TWO: JUICY by Ram Restaurant and Brewery out of Schaumburg, bought on release date 10/1/16, so canned earlier that week. It was a much lighter color but also cloudier than the Nimbus. I remember when I had this the first time-it was from a bottle shared with me, and my comment was that it might have been the coolest looking double IPA from the Midwest that I had ever seen (even over every Pipeworks “Fish Series” that I’ve tried). The thing that struck me the most about the appearance was how it had a mass of the smallest bubbles I think I had ever seen in a beer (the canned batch, this wasn’t as present). This had a very healthy thick lacing as well. As for smell and taste, this one has a much stronger hop presence than Nimbus, and the citrus (mostly lemon notes) comes through a lot more, with practically no bitterness. It’s also a thicker, heavier, and creamier beer, but also amazingly smooth. They ran through this quickly at the last release (like most of the special beers they do), so I imagine it’s only going to be just as hard if not harder to get the next time they brew it. NOTE: The above numbers were from the first time I had this from a bottle. However, most of the notes were from the recent tasting from can, and I would not change the rating at all. On tap, can, or bottle – TRY THIS BEER!!! Ever since I have had my first memories, my Dad has been a O-gauger. In simple speak: he has had an infatuation with trains, specifically O-gague, which defines a size of model trains (1:48 or 7mm:1ft) and is on the rather large size for model railroading. He worked for the Missouri Pacific Railroad that was bought out by the Union Pacific. If memory serves me, it was the C&EI before it was the Missouri Pacific. If you want to know more, Dad will fill you in any time, any place. He will talk trains as much as I will talk home brew. The two hobbies don’t mesh well together. Our basement was full of his trains and a layout, always in one form or another of completeness. I tagged along to monthly train meets: early Sunday morning drives that seemed to last for eternity. Once there, I worked odd jobs, walked through all the tables and wondered how cool it would be to have a layout with one of everything. A kid dreams. Dad is 80 now. In great shape and spry (I only hope to be as nimble when and if my turn comes at 80). His love for trains has never waned. His layout is more complete than ever. It is realistic. It is beautiful. It is a labor of love. This beer is in honor of the best Dad: a man who never looked the other way when it came to hard work or trying to make a better future for his family. The Train Man. I have found that I enjoy rye in a beer much more than I enjoy eating rye bread. A mix of rye spice works well with fruity and citrus hops. Azacca, a new hop for me, seemed to be a great place to start. I decide to add Columbus to get an extra spice kick while kicking up the citrus profile. The added IBUs would also assist with balance. The last time I brewed a rye ipa I only used two pounds of rye. I upped it to three here with the idea of pronouncing the rye in the finish even more (writing this also reminds me that I need to brew that rye ipa again). Leading up to this brew day, I worked on my grain mill to get it better dialed in for higher efficiency. Based on the brew day numbers, I was spot on for the first time in a long time with my gravity. This should help the balance since the bitterness will be a bit more in check. I am looking forward to this beer. Reusing many of the techniques from Baller IPA, I expect the mix of rye and Azacca to wow me. Enjoy! 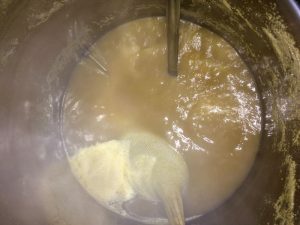 2016-11-13: moderate fermentation at 65.8*F.
2016-11-14: morning – moderate fermentation @67.1*F.
2016-11-14: evening – strong fermentation @67.1*F.
2016-11-15: morning – hard fermentation @70.1*F.
2016-11-16: evening – slowing fermentation @67.1*F. Added dry hops: 4.0 ounces 2015 Azacca and 1.5 ounces 2015 Columbus. Placed on heat @70*F to help finish. 2016-11-20: bottled with 3.5 ounces of priming sugar and 2.0 cups of water. 23, 22 ounce bottles. Bottle crown label: TM. Useless Fact: Al Capone’s business card said he was a used furniture dealer. 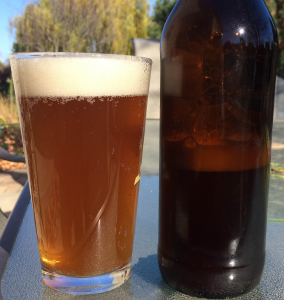 Used IPA was my initial attempt at an northeast india pale ale (NEIPA). Since brewing this beer, I have added two more NEIPA brew days to my repertoire: Smiles IPA and Baller IPA. Each iteration has been a better beer. This could be due to hops, malt and/or process, as I have changed them each time. I like variety. When adding 14 ounces of hops to beer, especially Amarillo hops, I expect great things. The vast amount of Amarillo hops was driven by two things: needing to get rid of 2014 hops and Daisy Cutter. Using up old hops is a no brainer. I don’t feel they lose much in terms of aroma and flavor, in spite of the alpha acid drop off. Keeping them in the freezer in vacuum sealed bags helps keep them fresh as possible. Being inspired by Daisy Cutter has been on the short since 2009, the first time I tasted the beer. The floral power of Amarillo jumped out at me and ever since I have wanted to brew up a home brew worthy. Look: Hazy but still able to see through the beer quite well. Pale gold to gold in color. Pure white, wispy looking foam covers. Great staying power. Sporadic lacing throughout. Aroma: Strong lemon. One dimensional. Taste: Lemon is strong again. Really the only characteristic that sticks out. Light, clean malt. Drinkability: Dry finish. Light end of medium body, possibly bigger. Crisp. Low bitterness. Good balance. Overall: There is nothing off on the base beer, just nothing exciting. The hops are subdued to the nth degree when they should be shining. Could this be a water issue? I know I have hard water. Nevertheless, I learned a bit on the NEIPA process and will revisit going forward. It could be process. It could be the age of the hops. It could be the change in my palate and nose. No matter, I didn’t get the hop profile from this beer that I was attempting to achieve. After being let down with this beer, I tried the original Daisy Cutter. Not what I remembered. I will only use Amarillo in conjunction with other hops going froward. Enjoy! Note: looking up Amarillo hops again, interestingly it seems that citrus is now described as the main aroma/flavor with most description not listing floral in the profile. Has the hop changed? Cubs Win 2016 World Series! 108 years has been too long of a wait. Being a Cub fan my entire life, I never thought this day would come. I thought the curse was real, allowing the team to only smell victory without ever having a chance to taste. The Cubs, since 1984, have had more chances at the playoffs than they did between 1945, the last time they were in the World Series (my dad was 9) and 1984. The Cubs had been gaining momentum since ’84. What a wild ride. Emotions were all over the place and Maddon’s decisions to pull pitchers pissed me off. Especially Hendricks and Lester. I think of all my family and friends that never made it to this day, especially my Uncle Ray, a die hard Cub’s fan. This is for him. Enjoy! Useless Fact: The cruise liner, Queen Elizabeth II, moves only six inches for each gallon of diesel that it burns. Posted in Lounge | Comments Off on Cubs Win 2016 World Series! You are currently browsing the Sips blog archives for November, 2016.